On a side note, my yaml file is attached and I'd like to know whether I am correctly calling bower to restore my UI packages. Sorry to hear that. We've been seeing nuget restore issues across all data centres. What nuget packages do you have problems restoring with? Unable to find version '5.2.3' of package 'Microsoft.AspNet.Cors'. Unable to find version '3.5.2' of package 'Autofac'. Unable to find version '5.2.3' of package 'Microsoft.AspNet.WebApi.Client'. Unable to find version '2.0.7' of package 'Serilog.Sinks.MSSqlServer'. Unable to find version '6.1.0' of package 'Sendgrid'. Unable to find version '3.0.1' of package 'Microsoft.Owin.Security.OAuth'. I've enabled package cache as you suggested but still no luck. What I don't understand is that I can't reproduce these issues even when my nuget package is empty on my local environment. AppVeyor build cache works when all packages are restored and build is successful. Look at these test build results, for example, with nuget restore verbosity set to detailed. There is no "Unable to connect" message, but the response "Unable to find ..." comes from nuget.org API: https://ci.appveyor.com/project/FeodorFitsner/appveyor-bot-test-2r9... It's like if you were requested a package with non-existing version. Locally it usually works because there is nuget cache in %localappdata%\NuGet\Cache folder which is never/rarely cleaned. Just to further assure you that this is nuget.org issue I've just removed %localappdata%\NuGet\Cache folder and did nuget restore for this project. Result attached - this is my local dev machine. I've figured out the solution though - you could retry nuget restore few times until exit code is 0. That did the trick ;) Thanks a lot! Just a quick question though: Do I always have to install bower in my 'install scripts' or does it come with pre-installed ? Yes, bower should be installed all the time. Unfortunately I'll have to bother you again with this. This nuget restore problem is killing me! Although you have provided me with a good workaround, nuget has been failing to restore packages saying "unable to find version X of package Y." This is a new error. What's worse, it doesn't fail the build, it continues with the pipeline and fails at the end as it cannot put a package together. For every commit I make I have to run the same build a number of times to get it pass this issue! 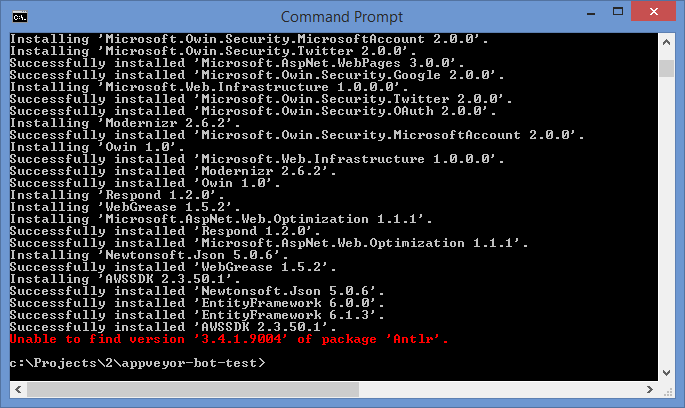 Can you make AppVeyor a little more robust when restoring nuget packages? I understand that this might be outside of your control however AppVeyor is really dependent on nuget and am sure this is impacting a loft of your customers. "Unable to find version X of package Y" is server-side nuget.org error (meaning AppVeyor was able to connect but got error response from nuget.org server) and I'm afraid there is nothing we can do with that. How do you call nuget restore command? If you call it in "CMD" mode (or no ps: prefix in appveyor.yml) then it should fail immediately if exit code is non-zero. Instead of bare nuget restore command use this batch with retries: http://www.appveyor.com/docs/nuget#restore-with-retries - works like a charm in 99% of cases. I was already using your nuget-restore.cmd script. It's pretty good. Will enable package cache, thanks for the tip. And will also let you know if there is anything problems with that.